We offer 5* luxury rooms for your beloved dogs, whilst you are on holiday, why not let your dog have a holiday too. 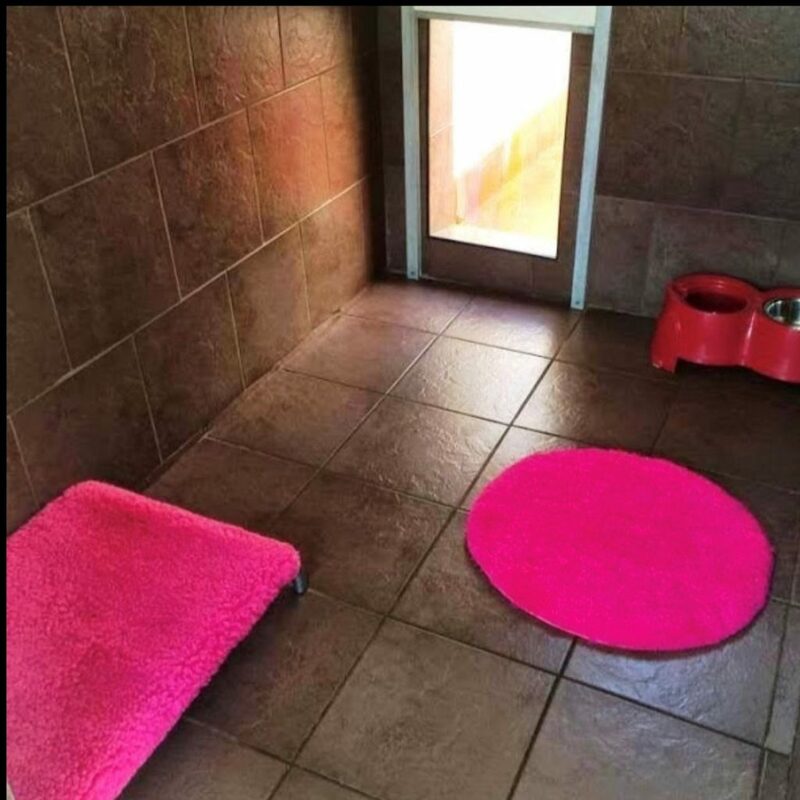 There are plenty of kennels out there stating they are luxury, be aware this may not be the case and would advise pet owners to go and view the facilities and meet the staff and feel confident and happy before they book. Our Luxury Rooms are more like a kitchen/utility room, which most dogs are accustomed to. A lot of thought has gone into the design of our luxury rooms to ensure your beloved pets are as comfy and settled whist left in our care we strongly recommend viewing and early booking is essential, especially at summer holidays. All rooms are fully tiled with under floor heating and heat lamps directly above the beds. They are light, spacious and fitted with PVC half glazed doors and furnished with Kuranda raised beds and flat screen TVs on the wall. Each room has an outside attached run which are fully covered to protect your dog from our changeable British weather. All rooms exceed the minimum sizes required by the council to accommodate dogs. We have met all the requirements to be rated 5 stars by Durham County Council. We have built the luxury rooms to the specification that we would want our dogs to have while being looked after. We feel that dogs deserve a better living accommodation than what some places provide. We don’t offer just luxury accommodation but also give them the love, respect and care and are kept in extremely clean conditions, basically we love and care for your pets how we look after our own pets. We can supply a high quality dry complete in a large or small sized kibble which is included in the daily rate, we can also add a wet add in if they like some meat added, Veterinary/wheat free/gluten free/grain free/low fat/special diets/home cooked meals or cooked meats must be provided by the owner and is not included in the daily rate. Your cat will have its own, fully heated, comfortable chalet with background music to help soothe your cat, all chalets have the benefit of having their own separate outside fully enclosed run which is attached to their own cosy inside chalet. We can also accommodate 2 or 3 cats from the same family who you wish to share, so that your pets may enjoy continued companionship. Sleeping areas are fully tiled, enabling us to maintain meticulous standards of hygiene. Bedding is scrupulously washed daily. We will supply all litter trays/scratch posts/bedding, food although we advise you to bring something from home with your smell on to help your cat settle in his new environment quicker. We stock the most popular brands of wet cat food and can feed either a choice of Whiskas, Felix or Gourmet Perle – any other brands will need to be provided. We also offer our own dry complete, or you can bring your own if you prefer. Your cat must have up-to-date vaccination against Feline Enteritis and Cat Flu. All booster must be done at least 2 weeks prior to boarding under licence conditions, We ask for these to be sent 1 month before if possible to our email so we can update the records ready for arrival, Please note all cats must be treated for worms & fleas with a veterinary prescribed treatment at least 2 weeks before admission to protect all cats in our care. We can also give cats medication if required, please inform us at time of booking, there is an extra charge for this, please note we do not accept diabetic cats.